Recent advances in periodontal treatment allow us to now place medications directly at the site of infection. One of the most commonly used medications of this kind is Arestin. This is often used in conjunction with scaling and root planing. In addition, an antimicrobial rinse is sometimes used after some procedures. 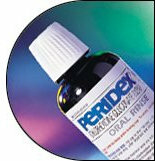 Peridex® is a prescription mouth rinse that reduces the redness, swelling and bleeding of gums caused by gingivitis.Dr. Fattahimay prescribe Peridex® for use between visits.